If you like peanut butter, you'll love our Peanut Butter Cookie bar. Loaded with whole oats and organic dark chocolate, the biggest difference from a real cookie is that you won't feel guilty if you accidentally eat too many in one sitting. Like most of our bars, having some form of milk on hand is definitely recommended for this one. 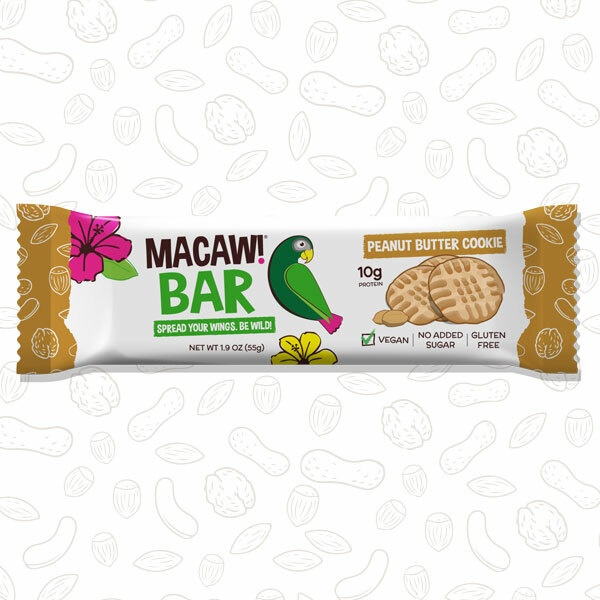 Although there’s no baking involved with our version, you’d be hard pressed to tell the difference between a Peanut Butter Cookie Macaw! Bar, and the “real” thing. 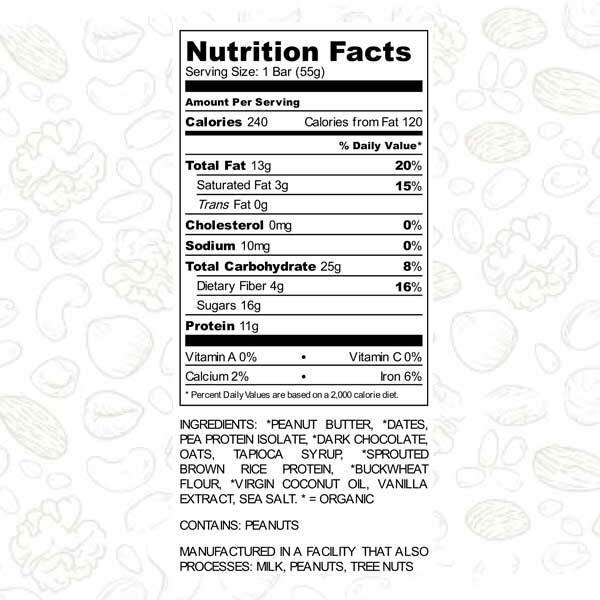 For this one, a generous combination of organic peanuts and organic pea protein crisps create a nice crunch with every other bite, complemented by organic dark chocolate, a touch of organic cashew butter for taste, and just the right amount of sea salt. With it’s soft, moist texture and explosive flavor, you’d never guess it to be one of our three vegan recipes, utilizing our special blend of organic pea protein and organic brown rice protein. 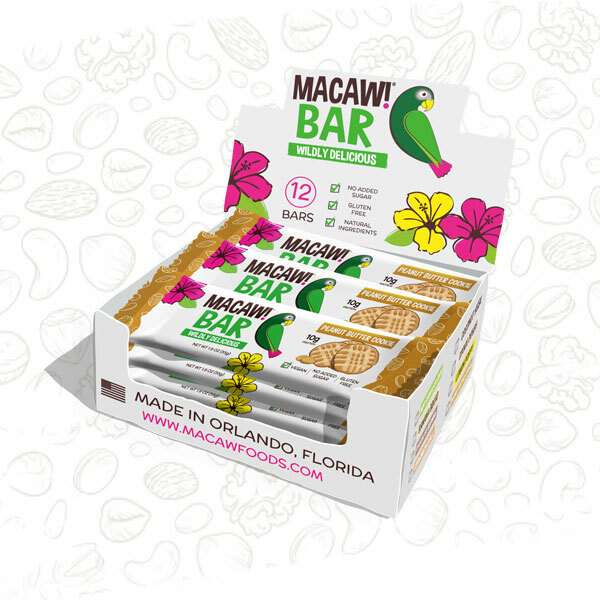 Due to the naturally drier characteristics of peanut butter, versus an alternative like cashew or almond butter, achieving a texture worthy of Macaw! standards, was a tricky feat. Luckily, tricky feats have never slowed us down around here! Depending how future production experiments go, you may witness the return of its predecessor, known by our longest running customers as, “Peanut Buttery Cashew”. This was a unique recipe that contained only peanut butter and no date paste. If it comes back, you’ll know. In the meantime, pour yourself a big cold glass of cashew milk, and grab a cookie! In order to get some serious peanutty flavor, we loaded as much organic peanut butter as we possible could into this bar. To heighten protein levels, we use a proprietary mix of two highly digestible vegan proteins (pea and sprouted brown rice). Although there are only small amounts of vanilla and sea salt present here, they are an integral part of the overall flavor. To really make these bars taste like a PB cookie, we had to add some dark chocolate chips and dry roasted peanuts. Pea protein crisps add some crunch, while virgin coconut oil makes sure things never get too dry.